The Rebel Sweetheart. : Foodie Goodie | Chicken and Pepper Egg Rolls. It's that time of the year again - when your fridge will be filled with leftover food from the New Year. I know, because I still have leftover ham and chicken from two days ago. Haha! Now if you're stuck in the same rut as I am, here's what you can do with the leftover chicken. 1. Heat a large pan over medium-high heat and add 2 tablespoons oil. Saute pepper and onion for at least five minutes. 2. Add the chicken strips to the pan. Saute for another five minutes. 3. Add soy sauce, garlic and ginger and stir well. Cook until most liquid has evaporated. 4. Remove from heat and cool for 15 minutes. Adding hot ingredients to the egg roll wrappers will cause them to break down and leak, so make sure the filling has been cooled properly. 5. 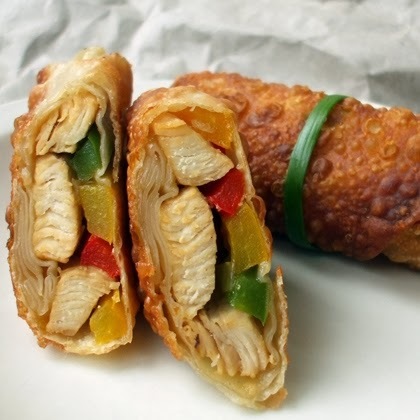 Once cooled, lay several strips of chicken, onion and peppers in the center of an egg roll wrapper that has been laid on a surface with one point toward you. Fold the right point over and under the filling. Fold the top and bottom points down and roll from right to left, securing the left point with a touch of water. 6. Repeat with all wrappers and filling. Heat 1/2 inch of oil in a skillet over medium heat. Fry egg rolls, turning over once during cooking, until golden brown. Drain on paper towels before serving. Eating healthy? Try baking them in the oven at 350° F for 10-12 minutes instead. My auntie did a similar dish, though she added more ingredients like cheese, ham, and she baked it instead of frying it. Seems really easy to do! Thanks for sharing! perfect way to 'recycle' leftover chicken! yummmm!